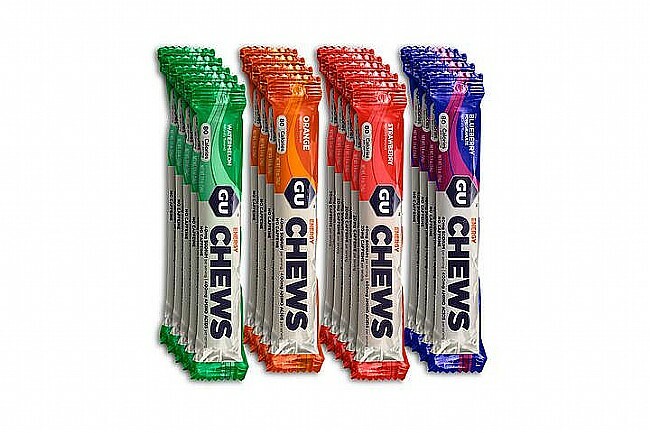 Created for daily training and competition, GU’s Energy Chews (also known as GU Chomps) pack energy-dense calories in a portable packet. Carbohydrates, sodium, and branched-chain amino acids help sustain the energy demands of long duration activities. Carbs delay bonking by sparing glycogen stores; sodium aids in hydration and maintains fluid balance; branched-chain amino acids (leucine, valine, isoleucine) prevent breakdown of muscle mid-/post-exercise and initiate protein synthesis which rebuilds and strengthens muscles. Strawberry Chomps have 20mg of caffeine per serving; Blueberry Pomegranate, Orange, and Watermelon are caffeine free. 1 sleeve of Chomps = 8 pieces (2 servings). Available in boxes of 18 sleeves (144 pieces). Each serving of 4-pieces = 80 calories.